The 3rd strategy that I will be tracking in this Blog is the DVI strategy as described and reviewed in post1 and post2. The strategy trades a universe of 26 ETF’s. The signals of this system are generated daily. At the moment my semi-auto setup does not yet allow for daily uploading to my blog. I am working on a daily email update. If you are interested to be added to the list of recipients, drop me an email at quantingdutchman @ hotmail dot com. I will notify you when things are up and running. It is a midterm trend reversal strategy that buys at dips and shorts at peaks. 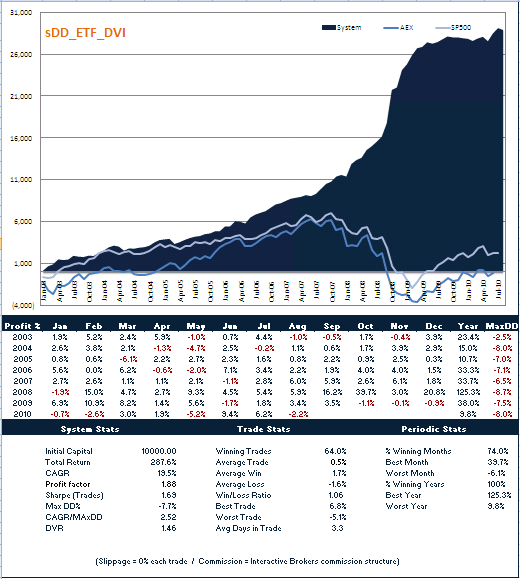 The strategy trades a universe of 26 ETF’s representing a broad range of indexes across various asset categories. ETF’s are used as they show lower volatility compared to shares and offer low-cost access to index trading for small investors. ETF’s included in the universe are: DIA, EEM, EFA, EWH, EWJ, EWT, EWZ, FXI, GLD, GSG, IEF, ILF, IWM, IYR, QQQQ, SPY, VNQ, XLB, XLE, XLF, XLI, XLP, XLU, XLV, XLY, XLK. The strategy enters long or short positions daily as described in the system code. Note that I’ve made a small tweak since the discussion in post2. Initial Equity is assumed to be 10.000$ as we are looking for to run strategies for small investors. The equity is split into 3 positions of 3333$ to spread risk. Going for smaller positions would increase transaction cost% to an unacceptable level. ETF’s are ranked by a calculation of DV2 to determine what two ETF’s are traded. The top 3 ETF’s in that ranking are selected. Below is a graphical summary of the simulation over the period 1-1-2003 through 13-8-2010. Transaction fees are based on Interactive Brokers fee structure and are included. Slippage costs have been kept at 0% as the strategy uses MOC orders. Hi, for now an operative question: how do you think to go short with ETF? As far as i know one can short most liquid ETF’s. Are you sure that you can short all 26 etf of the strategy? At Which cost? It’s important to quantify everythings. The results of the strategy downgrade too much without the short? With Amibroker is possible to do some montecarlo? The history is too short, so for me is important to have an idea of the average yield, stdev e mdd compatible with this strategy. For me this strategy could be a good strategy (if mean reversion continue to work in the next years) but, for example, a MDD of 7.7% is totally irrealistic. A montecarlo can give a better view of the real numbers. Thanks for your further questions. I just checked the contract details of the 26 ETF’s at Interactive Brokers and the short margin is equal to normal margin rules. Tx fees are the same. So I do not see any problem with shorting these 26etfs. With Amibroker it is possible to do MonteCarlo, however i never did it before myself. I am reading the book called `Evidence Based Technical Analysis´. When I am done, I think I will know how to set a MC run in Amibroker and run some experiments. I think shorting these is a service from IB, so I think it could be possible that other brokers don’t offer this as a service? Great Blog, I like it already.